Vinyl, or as we prefer, Vegan Leather, is finally here! We sourced out the highest quality product and our favorite to sew with. These products are used in professional applications and are very durable! Durability and gorgeous colors - what more could you want for a bag fabric? 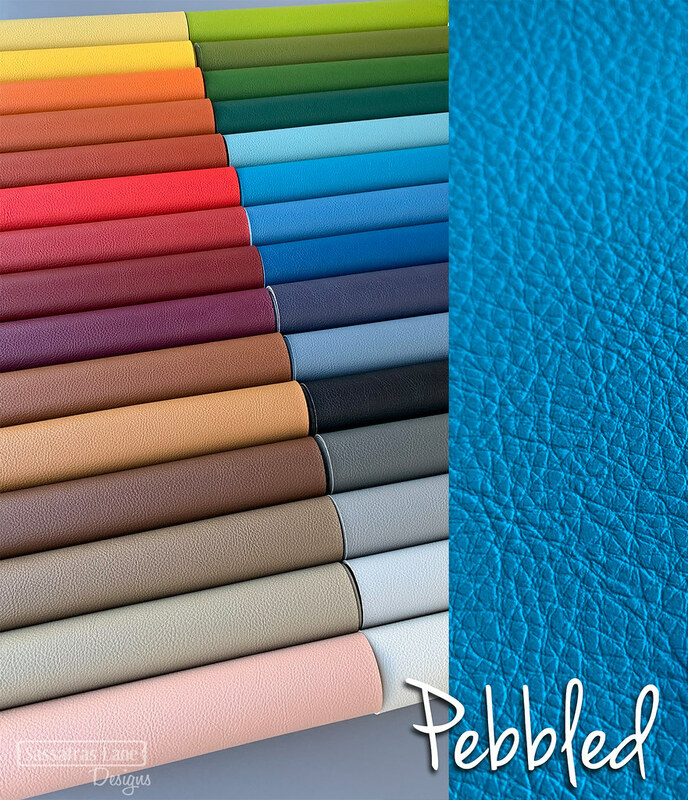 We are happy to offer 25 different Textured Vinyls, a fabric feeling product, and 30 different Pebbled Vinyls, which is reminiscent of textured leather. We chose to source a wide variety colors in both styles so they can be mixed together (and with our Cork!). Both products are fabric backed vinyl. The back of the Textured Vinyl is white while Pebbled Vinyl has a tan suede feeling backing. We love to make bags, wallets, household items and appliqué with it. These vinyl fabrics are easy to sew on and don’t stick to your machine or foot! We do recommend using a longer stitch for ease of feeding and a sharp needle such as a Microtex or jeans needle. Why we LOVE sewing with Our Vinyl! 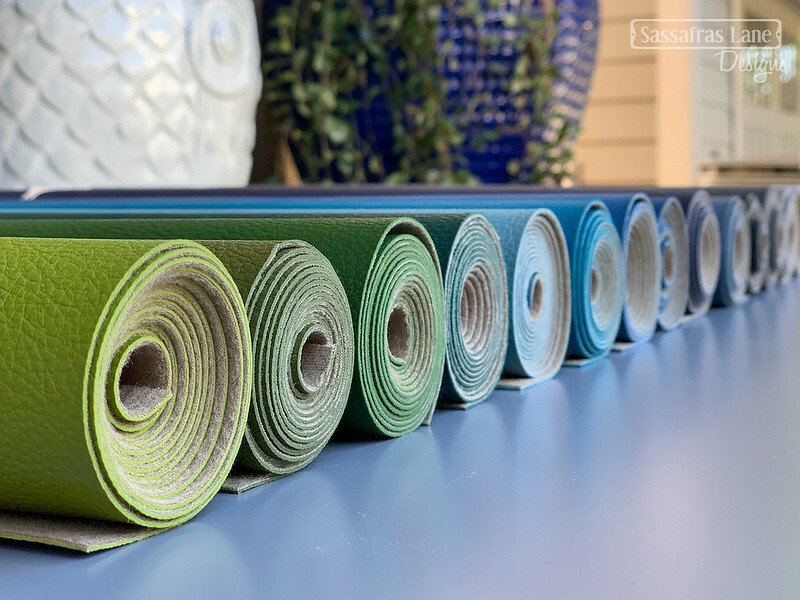 Now, if you have ever sewn with vinyl and had a bad experience, we want you to keep an open mind about our newest product! Not all vinyl is created equal and we only sell what we like to use, so when we were looking to source vinyl we looked for some important factors. We needed our vinyl not to stick to our machine or our sewing feet as we sewed. It couldn’t be so thick that it wouldn’t feed through a domestic machine, but it needed to be the perfect weight and have a good drape for bag making. And of course it had to come in a huge variety of awesome colors - 55 in total! It's Versatile - It is soft and pliable, with the perfect drape and structure for bags! It has Finished Edges - The edges don't need to be finished! Yup, that's right, it doesn't ravel, so there is no need to finish the edges. We take advantage of that in our new Natasha Tote and popular Quick Corky Wallet. It's Pretty - It comes in an amazing range of colors! 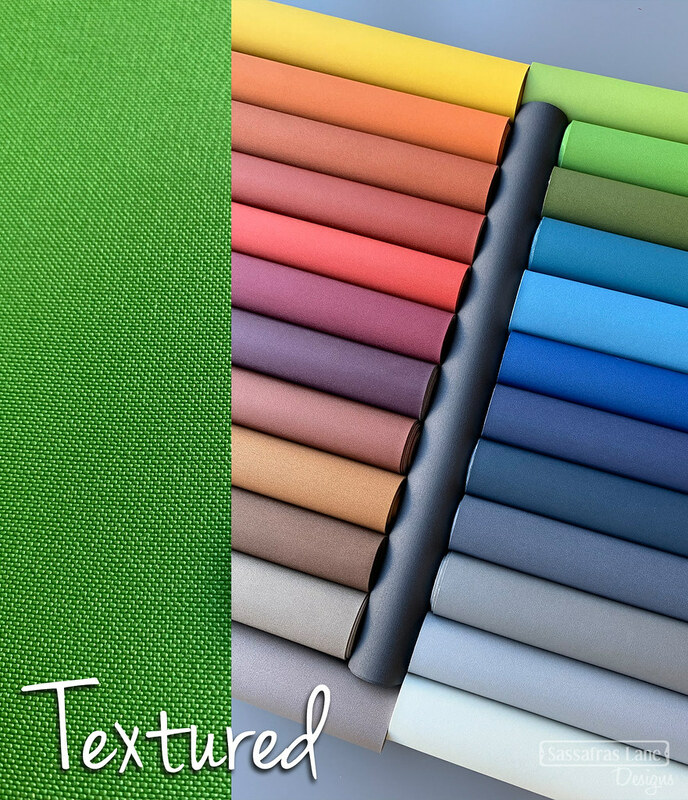 We are carrying a total of 55 colors, 25 of the Textured Vinyl and 30 of the Pebbled Vinyl. They blend and meld together beautifully, so get some each to play with! Now, the best thing is that sewing with this vinyl is EASY PEASY - and we would not josh you about a thing like this! Here are some recommendations to make your vinyl sewing even easier. Needles - Vinyl does not require a special needle. However, we would recommend a sharp needle such as a Microtex, sizes 80/12 and 90/14. Or for a stronger option, a jeans needle in size 110/18. Sewing Foot - No special foot is needed for sewing on our vinyl! We find lengthening our stitch helps our machine to feed the thickness of the vinyl better and we prefer the look of a longer stitch when top stitching. If your machine does grumble when sewing on vinyl, try a walking foot or a teflon foot. Ironing - Don't do it! You won’t want to iron the front of your vinyl, however, you can iron the back fabric side. If you want to iron the front side, place a piece of fabric on top of the vinyl while pressing. Interfacing - Vinyl offers a nice weight but if necessary, fusible interfacing can be applied to the back without an issue, just be sure to use a pressing cloth! Pining - Use clips (we love Wonder Clips) or double-sided basting tape to hold the vinyl in place while sewing it together. Pins will put puncture holes in your vinyl and they make it difficult to keep everything flat while sewing. Thread - We have had better results using a 40 or 50 wt thread and a triple stitch when top stitching, rather than using a thick thread. With thick thread you have to use a larger needle and the holes can be unwieldy. We hope you enjoy sewing with the vinyl as much as we do! Enjoy! Very useful information. And i have the correct needles in my stash! Will be placing an order soon.